Whether and how you were going to go down to the Mall and watch President Obama take the oath of office in person was all anyone talked about for the last week. After a lot of waffling (I gotta be me), I ended up heading down with a simple plan and low expectations. I figured as long as I go down early enough that there will be time to get home to watch it on television if it doesn't work out, I'll just take it as it comes. I swaddled myself with six layers of clothing, left Woodley Park shortly after 8, wandered down Connecticut Ave., joined the throngs pouring out of the Metro on L, K, and I Streets onto 18th, took a minor detour through the Constitutional Gardens, and wound up finding space a little after 9 am on the eastern slope of the Washington Monument grounds. I carefully picked out a spot with a view of the Capitol building, where the swearing-in would occur (even though I was so far away it was the size of a souvenir paperweight Capitol, there's just something about being within eyeshot of it), and, more importantly, a view of a jumbotron. I stood behind a group that had spread out a blanket around 8 am. Being behind the blanket ensured Sturgill wouldn't get in front of me at the last minute. Being on the sloped ground around the monument ensured I could see all the way to the Capitol -- and being so close to the monument itself added some bonus majesty to the occasion. By the end of the day I'd walked nearly 6 miles and was out in the cold for more than 6 hours. It was well worth it. It's easier to talk about the logistics than the extraordinary feeling of being among millions of jubilant Americans and people from all over the world as we collectively watched history being made, and felt a weight being lifted from our shoulders. Taking a cue from Brett (though I wish I had his eye for detail as well! ), I've put together a photo album of my experience on Tuesday. My sister who lives in Charlotte told me that her children had a snow day today, so they went sledding in the morning and came in to watch President Obama's swearing in at noon. They might not know this yet, but a snow day, sledding, and Obama's inauguration = the best day of their lives (so far). What a great day for our country, and I'm so happy I was able to see it firsthand (if watching on a jumbotron counts). I'm putting together a photo album, but if I try to finish (or to write more of my thoughts on the day) tonight, I'll be up till all hours. That would be a terrible way to start the new administration. More tomorrow. I'd hesitated to head down for the We Are One concert and inauguration kick-off event yesterday, but I'm so glad I did. Due to our lackadaisical attitude (and aversion to standing in the cold for hours before the concert), we got there too late to get into the secured area around the reflecting pool, but we staked out space on the Washington Monument grounds just about a minute before Springsteen kicked off the concert. I felt a bit ridiculous taking photos of performers on the jumbotron, but it was great just to be in the half-mile presence of the Boss . . .
and the Boss . . . When U2 came onstage -- a primary reason I made the trek -- we had a suddenly obstructed view. We'd move a few feet into a sudden gap in the crowd on the right, and there he'd be. A few feet to the left, and again . . . STURGILL! I was envious of the view these nearby tree climbers had until I uploaded the photo . . .
and saw how tired and uncomfortable they look. Enormously tall hooded men who appear from nowhere aside, the show was great. It moved along at a fast clip and I even enjoyed performances by artists I don't care for that much. The highlight for me -- surprisingly, since I went for Bruce and U2 -- was Mary J. Blige's rendition of "Lean On Me." It's a wonderful song, and the crowd turned into one big dance party (well, we were really just bopping, since we were bundled up like Ralphie's little brother in "A Christmas Story"). Other highlights were the whole Mall dancing along to "Shout" (sung by Garth Brooks), and Stevie Wonder's keyboards on "Higher Ground." The crowd was such a mix of ages and races, and it was funny to hear someone say "who's he?" when James Taylor (for instance) took the stage (though I admit I wouldn't have recognized Will.i.am in his non-hologram form). There was something for everyone, though, as shown by the two dudes pumping their fists to John Cougar (Mellencamp?) singing "Pink Houses" and shouting "You've still got it! You've still got it!" As we made our way east on the mall and looked back on the dispersing crowd . . . I resolved to face the cold and the crowds tomorrow and watch the swearing in (albeit on a jumbotron) in a crush of deliriously happy people. I'll just wear more layers. In the meantime, if you want to see some actually good photos of yesterday's happenings, check out these great shots on my friend's blog, brettstyle. This morning, as I was planning out the optimal way to go down to the Mall to see the We Are One: Opening Inaugural Ceremonies at the Lincoln Memorial with the least amount of exposure to cold, waiting, and porta-potties, I was reminiscing about President Clinton's inaugural festivities, including going to a concert at the Lincoln Memorial. I remembered at the end the whole crowd walking toward the Memorial Bridge, where the Clintons were walking to or from Arlington National Cemetery. I remember my friend Andrea clamping her hand on my shoulder and announcing to our group of friends we had to form a human chain so we wouldn't be separated in the throngs of people. (I think of this every time I'm in a massive, moving crowd -- "form a human chain!") What I don't remember is the cold, or the wait, or the hassle. I don't know if that's a trick of memory, or just the result of my having been 16 years younger, and lower maintenance. As with all rosy memories like this, I was second-guessing whether this really happened or I imagined it, but some photos on a Smithsonian website confirm what I remember. Above is a photo showing: an "aerial view of the Lincoln Memorial during the 'Call for Reunion' a two-hour outdoor concert kicking off the Clinton/Gore Inaugural. Hundreds of thousands of people crowded onto the Mall for the free concert which featured such entertainers as Aretha Franklin, Michael Bolton, Tony Bennett, Bob Dylan, Diana Ross and rapper L-L Cool J." Below, "the Clintons and the Gores lead a procession of thousands across the Memorial Bridge from the Lincoln Memorial to Arlington, Virginia on their way to the Bell Ringing Ceremony which was part of the kick off of the Clinton/Gore Inaugural. 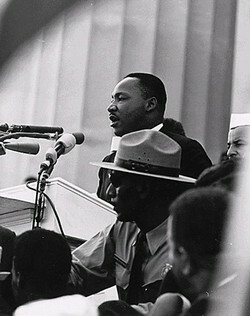 The procession and bell ringing followed a Call To Reunion concert at the Lincoln Memorial." Finally, the photo below shows an "aerial view of the 'Reunion on the Mall' held as part of the Clinton/Gore Inaugural. With tents stretching from the Capitol to the Washington Monument, it was reported to be the largest festival ever held on the Mall. This photo was taken from a U.S. Park Police helicopter hovering so the top of the Monument is in the foreground of the picture." I worked as a volunteer at the festival, but instead of being assigned to one of the tents featuring musical acts like Los Lobos, Robert Cray, or Little Feat, I was assigned to the Family Fun tent, where Raffi and the muppets performed, and my most difficult job was trying to placate parents who got their children there too late to see Big Bird. (Big Bird came out and did another impromptu performance.) I still have my red baseball cap reading "SECURITY AID The 52nd Presidential Inaugural." I wonder if that'll get me special treatment today? If you're not going to the Mall today, HBO is showing the concert live (starting at 2:30) and on tape (at 7:00 tonight), and I understand some cable systems and satellite operators will be making it available to those subscribers who don't subscribe to HBO. You can also watch on HBO's website. Visitors will enter a dramatic five-story sky-lit atrium, surrounded by artifact displays filled with more than 400 objects showcasing the breadth and depth of the museum’s three million objects representing the cultural, social, technological and political history of the United States. An architectural representation of a waving flag—960 reflective tiles made of polycarbonate material—frames the entrance to the Star-Spangled Banner gallery [above]. The gallery itself is a climate-controlled state-of-the-art chamber designed to evoke the "dawn’s early light." An exhibition that includes multimedia displays and historic objects will tell the story of the flag and the National Anthem. You can find Reopening Weekend Activities here. 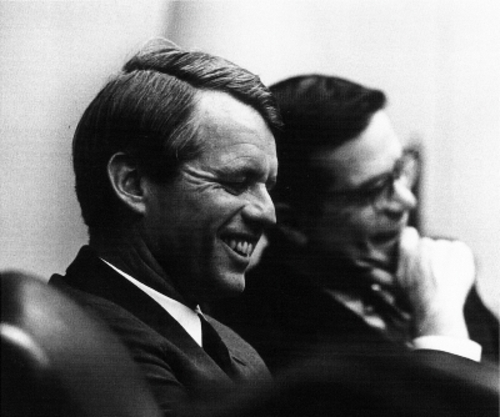 Sorensen returns to January 1953, when he and the freshman senator from Massachusetts began their extraordinary professional and personal relationship. Rising from legislative assistant to speechwriter and advisor, the young lawyer from Nebraska worked closely with JFK on his most important speeches, as well as his book "Profiles in Courage," Sorensen encouraged the junior senator's political ambitions--from a failed bid for the vice presidential nomination in 1956 to the successful presidential campaign in 1960, after which he was named Special Counsel to the President. Illuminating, revelatory, and utterly compelling, "Counselor" is the brilliant, long-awaited memoir from the remarkable man who shaped the presidency and the legacy of one of the greatest leaders America has ever known. 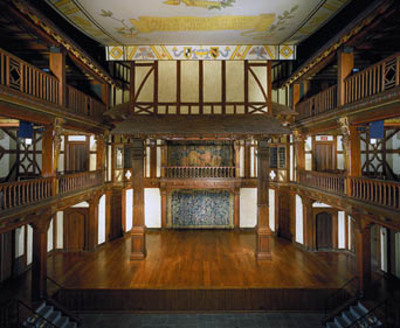 As an English major at Georgetown University, I was delighted to go to a performance of a Shakespeare play -- I don't recall which one -- in the beautiful Elizabethan theatre at the Folger Shakespeare Library on Capitol Hill. Since then the Shakespeare Theatre Company has moved to Penn Quarter, but the Folger continues to put on exhibits, plays, and musical performances. A rich and varied assortment of lyric song including the Gallician poet/singer Martin Codax's Seven Songs of Love, Western Europe's first song cycle. Treating love in all its guises, the songs of the troubadours and lively dances for fiddles, harps, citole, and percussion celebrate the joy of love requited. Macbeth's enchanted homeland has a fascinating musical tradition dating back to the Middle Ages. This trove of Scottish riches -- traditional and courtly, simple and sophisticated -- is explored with medieval accounts of battle, songs from the 16th and 17th centuries, distinctive Scottish music for pipes and fiddle, and music from the French allies of the Scots, preserved only in Edinburgh. This musical event, running April 18 to 20, complements the Folger Theatre's production of Macbeth, which runs from February 28 to April 13. Here's an interesting tidbit about the play: one of its directors is Teller, of Penn & Teller, and includes magic designed by him. (P.S. Teller is the quiet one.) For those of you up in New Jersey, the play is running at the Two River Theater Company in Redbank until February 17. This exhibit considers the ways in which the early modern British made, and remade, their own history. "Making History" focuses on how key events, such as the controversial execution of Mary Queen of Scots or the murderous Gunpowder Plot, were interpreted in the period, as well as on crucial ideas that helped shaped those interpretations. It also examines some of the period's most important figures, both real (Charles I) and imaginary (Shakespeare's Falstaff), and the roles they played in the making of British Renaissance history. "History in the Making" is on display in the Folger Great Hall until May 17, Monday through Saturday, from 10 am to 5 pm. If you're still looking for a way to celebrate Martin Luther King's legacy today, head to the Folger for a poetry/speech reading and open mike event hosted by Donnajean Ward, the Folger Consort Manager, and Teri Cross Davis, Folger's poetry coordinator. The event is free, and runs from 2 to 5 tomorrow, Monday, January 21. 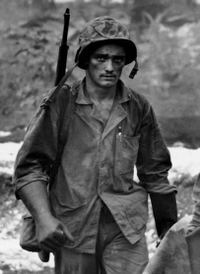 As the crowd booed at Phillies manager Charlie Manuel, who was arguing with the ump for changing a call in favor of the Nats at RFK on Friday night, one fan gesticulated at the field with something that turned out to be the WETA newsletter, with a headline about the new documentary,The War, emblazoned on the front. Do people in other cities bring public TV stations' newsletters to the ballpark? Although it feels as if only someone living under a rock wouldn't know Ken Burns's seven-part WWII documentary is about to begin, here's a reminder that it starts tonight at 8 on your local PBS station. If you're wondering whether it's worth 15 hours of your time, you can find more then 30 (mostly rave) reviews on Metacritic. 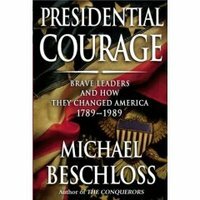 Presidential historian Michael Beschloss will appear tomorrow night, May 11, at 7 pm, at Politics and Prose to read from his book, Presidential Courage: Brave Leaders and How They Changed America 1789-1989, in which he explores crucial moments when presidents ranging from George Washington to Ronald Reagan took courageous action that changed history. Stuck in traffic on Tuesday I heard Beschloss talking about the book on NPR's Fresh Air. They played long clips of recorded conversations with several presidents, including Harry Truman on recognizing Israel and John F. Kennedy on the Civil Rights Act. It was so fascinating I was disappointed once I got past the construction on the 14th Street Bridge. If you can't make it to P&P, you can listen to the Fresh Air interview here.